is pictured below as an adult. This camp was the western most Hayne Blvd. camp--located just east of the Lakefront (Shushan) airport. 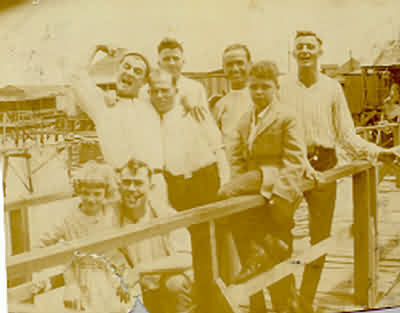 The photo was taken in 1919 or 1920. The great-grandchildren of the little girl pictured above brought their family photos to us at St. Philip Neri School. 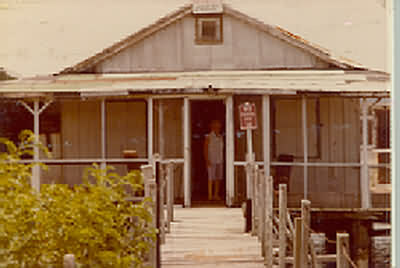 The camp was owned and enjoyed by the family for 5 generations. Named 'Tootsie Roll' after Morris 'Toots' Powell, Sr. this camp was rebuilt twice--first after arsonists burned it down and then after Hurricane Camille. 'Tootsie Roll' was destroyed in the 1980's to make way for the South Shore Marina, an overpass, and Harrah's Lakeshore Resort. Another view from the levee. 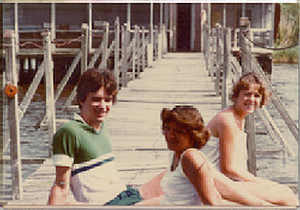 ChuckBrechtel, Ellen Boudreaux Brechtel, and Liz Brechtel Manning relaxing. Viewed from the back walk. 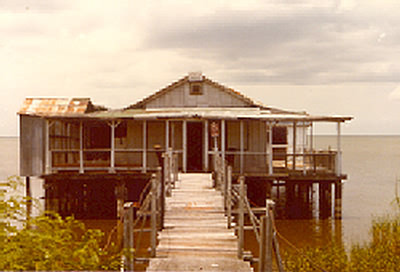 burned down by arsonist and the second one got blown down by Hurricane Camille. of the camp because we had a lot of wonderful times and memories. tracks and go to the Time Saver across the street to use the phone.